Can’t help it….I love me some Sia. I liked this lady’s style, so I (semi-creepily) took a photo. She had a cool asymmetrical, braided haircut and mixed patterns/fabrics really well. Fashion photography centered on African themes is often so fetishized or romanticized that it becomes less about representing a continent or a people than it is about being exotic for the sake of exoticism. So much so that the personal touch Viviane Sassen injects into her work goes miles to separate her from others who travel to the continent as visitors. Sassen, a Dutch fashion photographer who lived in Kenya as a child, has a way of making her portraits feel authentic despite how highly stylized they are. Even the most obviously posed portraits have an almost candid quality. And throughout, her love for Africa and affection for the people she shoots come through as vibrantly as the rich colors she favors. 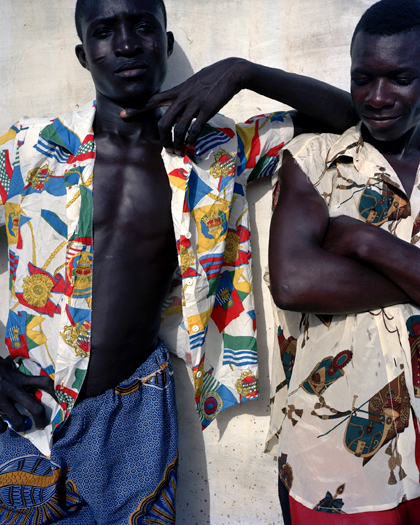 Sassen is also creating an alternative view to what many outsiders think of Africa, in a way that only an insider can. As she told Karin Nelson of the New York Times, “People in the West have a quite limited idea of what the place is about. Hunger, war, AIDS … It’s so much more diverse and exciting.” See more of her work after the jump. And we all know my love for graffiti.